Fox Trap - Humane Live Catch Cage Trap for catching and trapping urban foxes. Simple to use, just bait with pieces of meat just behind the treadle plate - the fox then enters the trap and stands on the treadle to reach the food. The door then closes trapping the fox inside. 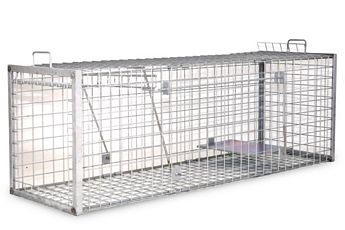 The Fox Trap gives effective trapping and catching of urban foxes humanely.